Have You Claimed Your Local Google Listing? Google Places is now called Google+ Local. It’s where you can create, edit, and manage your Google Places – I mean Google+ Local – listing. Yikes, this is all changing so fast! Yes, it is confusing. 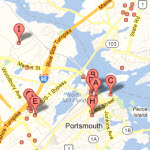 Google+ Local is an important part of your overall online visibility. If you attended my online Internet marketing workshop today you saw that in just the past 30 days one of my clients had over 6000 impressions (their local/map listing was shown more than 6000 times) and as a result they got 479 clicks – all for free. Well… not exactly free, the Google Places, now called Google+ Local listing was created, optimized, and uses descriptions with very targeted keywords/phrases.